Skinner's Field & Trial Muesli Mix offers an appetising blend of protein-rich meats, steam-cooked cereals, cooked peas and crunchy biscuits for a complete and nutritionally balanced diet. The food is packed with selected natural flavours to appeal to even the fussiest appetites and contains balanced, slow-release energy ingredients to promote endurance and lean body tone. Specially formulated to cater to the needs of working dogs, providing all the essential fibres, complex carbohydrates and proteins needed for maintaining an active lifestyle. Protein pellets containing beef meat meal, wheat glucose syrup, cooked flaked maize, extruded wholewheat biscuits, cooked flaked peas, cooked wheatflakes, oils, vitamins, minerals and trace elements. Vitamin A 15,000 iu, Vitamin D3 2,150 iu, Vitamin E (as alpha-tocopherol acetate) 145 iu. Iron (as ferrous sulphate monohydrate) 15mg, Iodine (as calcium iodate anhydrous) 2.4mg, Copper (as cupric sulphate pentahydrate) 10mg, Manganese (as manganous oxide) 47mg, Zinc (as zinc oxide) 133mg, Selenium (as sodium selenite) 0.14mg. Contains EC permitted antioxidant. 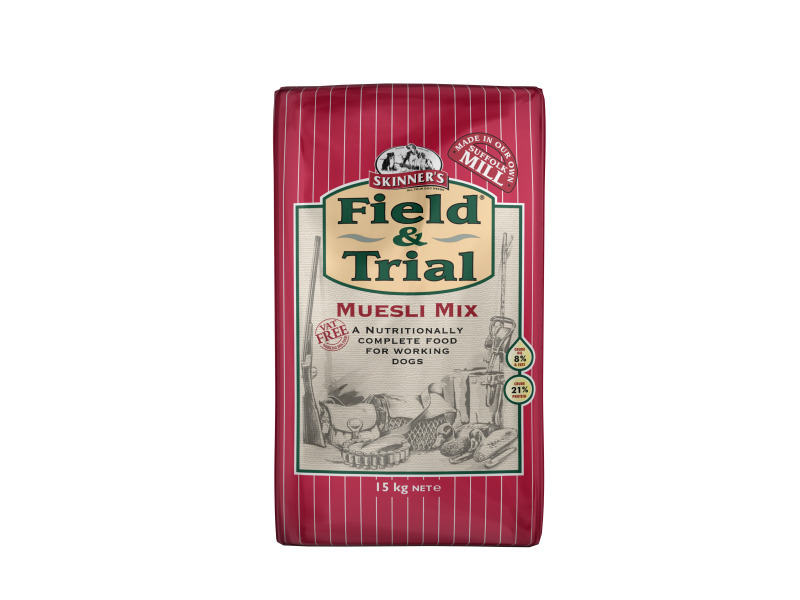 Below are some recent questions we've received regarding Skinner's Field & Trial Muesli Mix Dog Food, including answers from our team. Thank you for your question. I have spoken to our vet who says you could try mixing a small amount the Muesli with your dogs food but there is always a chance that this could cause a flare up of the pancreatitis. A better option would be to continue with the specific diet and include a probiotic supplement such Protexin Pro-Fibre which should help firm up his stools.